A high-performance seamless AV modular matrix switcher providing 12 flexible PCIE slots for single HDMI HDBaseT input/output cards and 4 fixed slots for output signal cards. 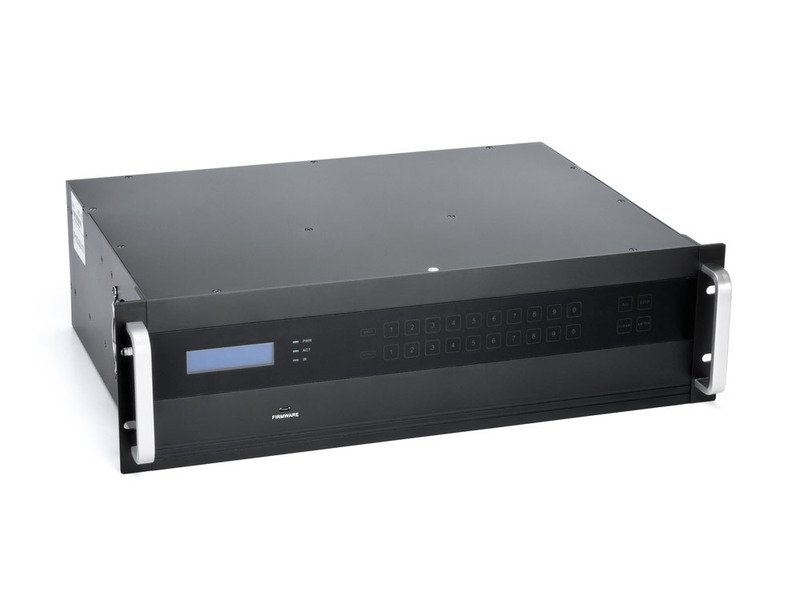 A high-performance seamless AV modular matrix switcher providing 12 fleixble PCIE slots for single HDBT input/ouput cards and 4 fixed slots for output singal cards. 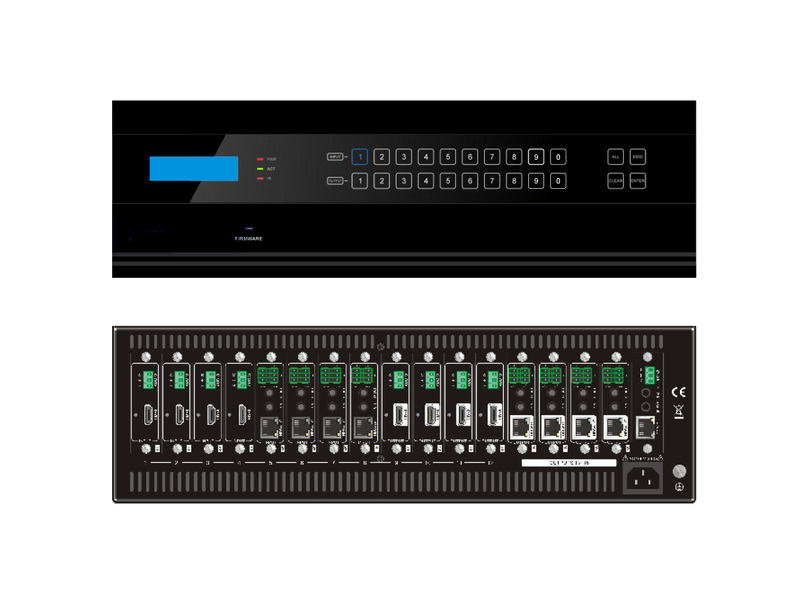 Includes 16 Port Chassis 8 HDBT 4K@60Hz Output Cards and 8 HDBT 4K@60Hz Input Cards. With the advanced modular design, you can modify the matrix with the AV input and output cards that you need. The Matrix is able to support HDMI input and output cards supporting inputs up to 4k@30Hz, outputs up to 1080p with seamless switching. Every audio and video signal is transmitted and switched independently to decrease signal attenuation making seamless switching easy while supporting many different AV signals. The controls on the front panel of the matrix and IR capabilities are intuitive and easy to use or you can take control from RS-232 and IP to make all displays easier to manage. Interchangeable Cards means Future Proof. 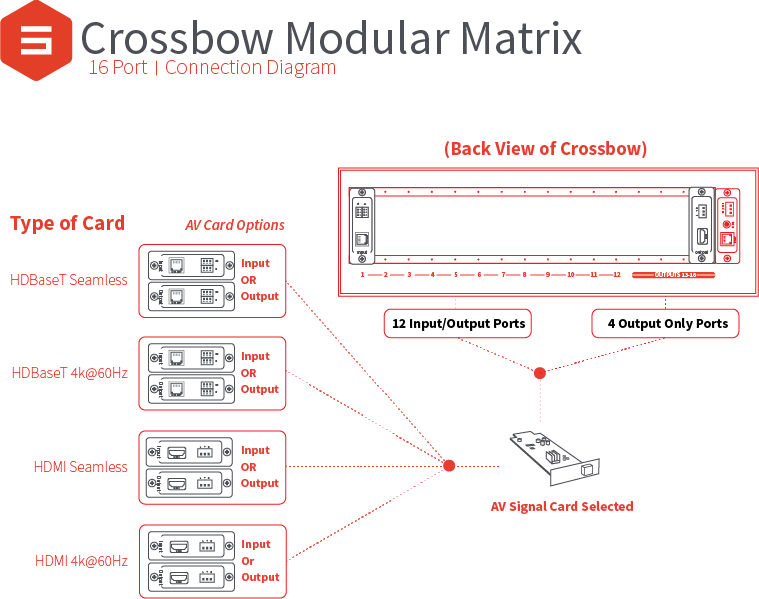 The Crossbow Modular Matrix is able to run future displays or inputs that you may purchase up to 4k@60Hz. With the customizable cards, you can simply change the cards for whatever your setup needs. The Crossbow is the future proof you need to having the latest and greatest always without having to invest thousands more to a new setup.